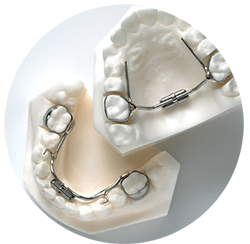 The most common and recognizable braces are the stainless steel braces. These braces are very durable and different color ties may be used with them for decorative purposes to enhance the orthodontic experience. Ceramic braces are made of clear/tooth-colored materials and are therefore less visible on your teeth than metal braces. For this reason, ceramic braces are used mainly on older teens and adult patients who have cosmetic concerns and would like the orthodontic experience to be less conspicuous. All of these systems, including Invisalign and Clear Correct, use a series of clear, removable, and comfortable aligners to gradually straighten your teeth. Not only are the aligners invisible, they are removable, so you can eat and drink what you want while in treatment, plus brushing and flossing are less of a hassle. The Clear Aligner systems are not for everyone, Dr. Tsibel will tell you if you are a good candidate for this treatment modality. These braces are placed on the back of your teeth. They are comfortable and easy to wear, and are completely hidden throughout the entire treatment process. Thus, this treatment is truly Invisible Orthodontics. These braces are NOT for everyone, Dr. Tsibel will tell you if you are a good candidate for this treatment modality. We utilize the smallest, most comfortable and compact expanders on the market for children and adults. Even though they still take a little time to get used to having in the mouth, these mini-expanders tend to be much more comfortable and easier to take care of and keep clean then the traditional, larger and bulkier expanders. The expanders “expand” (widen) your upper and/or lower jaws by putting gentle pressure on your upper and/or lower molars each time an adjustment is made. We will instruct you about when and how to adjust your expanders. When you achieve the desired expansion, you will likely wear the expander for about four to six additional months to solidify the expansion and to minimize future relapse. 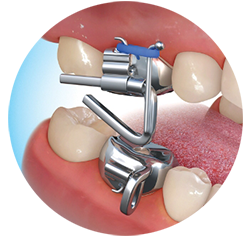 The MARA (Mandibular Anterior Repositioning Appliance) is a powerful and effective bite corrector and is used to reduce/correct the excessive horizontal overlap between upper and lower front teeth commonly referred to by lay people as "overbite". This appliance causes the lower jaw and lower teeth to move forward and the upper molars/teeth to move backward thus correcting the "overbite". In a growing individual the MARA helps to encourage a more favorable and balanced position of the lower jaw in relationship to the upper jaw improving the overall jaw balance and facial appearance, in addition to "overbite" correction. We often call the MARA the "invisible headgear" because in many ways it does what a traditional headgear would do but without the need to wear the actual headgear that makes kids feel self-conscious about their appearance. Also, because the MARA is attached to your teeth and braces without being able to be taken out, its working full time, 24 hours a day, to fix the "overbite" and improve the jaw balance quicker than traditional headgear treatment. 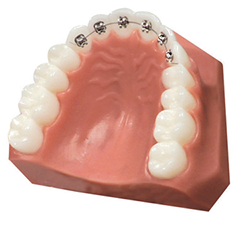 The MARA is typically worn for 9-12 months, with the braces, after that time the MARA is removed and braces continue to stay on the teeth until full treatment is completed. 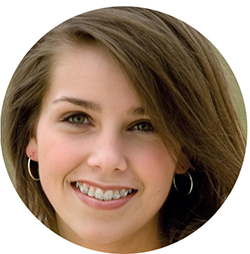 Rubber bands (elastics) are usually used with the braces after the MARA is removed to stabilize the bite correction in preparation for treatment completion. The overall treatment time for MARA and braces together is usually 24 months, thus MARA usually stays in the mouth for about half of the time. You can download our MARA patient handout attached at the bottom of this page. The Facemask appliance may be used as early as age 6 to help move the upper jaw forward in patients with an underdeveloped or deficient upper jaw that is behind its ideal position (and in relation to the lower jaw). These individuals often present with an underbite, where the upper front teeth bite behind or against the lower front teeth. During normal facial development the upper jaw tends to be in front of the lower jaw throughout childhood roughly until the time of puberty when the lower jaw "catches up" to the upper. During puberty the lower jaw undergoes its biggest forward growth spurt which typically outgrows/outpaces the diminishing forward growth of the upper jaw. Thus, in cases where the upper jaw is already underdeveloped/deficient and is behind its ideal position and the lower jaw during early childhood (around age 6-8), it is not likely to ever "catch up" with the surpassing lower jaw via normal growth and the underbite persists for years to come impeding proper bite development. Furthermore, this underbite worsens as the child progresses into late adolescence and adulthood since the lower jaw tends to outgrow the upper during the pubertal growth spurt. 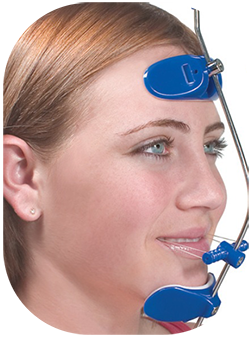 The Facemask is a very specialized appliance that can move the deficient or underdeveloped upper jaw forward into a better balance with the lower jaw correcting early underbite, establishing better bite function and development, and improving child's jaw balance and overall facial appearance for years to come. It is recommended to start Facemask treatment as early as possible, around age 7 or 8, because the ability to predictably move the upper jaw forward diminishes more and more as the child gets older. Dr. Tsibel co-authored a clinical article on Facemask therapy, you can find it here. You can download our Facemask patient handout attached at the bottom of this page. One of the toughest orthodontic problems to fix is when your top and bottom front teeth overlap excessively in a vertical dimension. This is known as a “deep bite”. The long-term success and stability of your treatment depend on correcting/"opening" the deep bite, which will speed up treatment and allow the teeth to align more quickly and predictably. That is why we put on the TURBOS bite opening appliance. The turbos maybe made of metal or of blue (or white/clear) plastic material and are placed/glued behind each of the two upper front/central teeth, so that when you bite you will only contact the turbos with the bottom front teeth making the back and side teeth not touch at all. The braces will quickly begin to guide the back and side teeth into proper position/alignment and towards each other, and once they meet the deep bite of the front teeth is corrected. You can download our Turbos patient handout attached at the bottom of this page. Interproximal Reduction or IPR is the removal of a very small amount of enamel from between the teeth to slightly reduce their width. Also known as reproximation, slenderizing, stripping, enamel reduction or selective reduction. 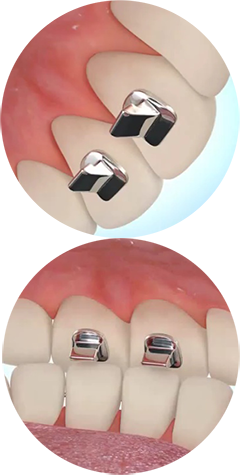 Whatever the name, the intentions of the procedure are the same - to acquire more space for your teeth, to bring your teeth into ideal alignment, to improve your bite (the way your teeth fit together), to compensate for discrepancies in tooth size, to make the teeth more attractive, and/or to eliminate/reduce "black triangle" spaces (see below). IPR is usually done in combination with orthodontic appliance treatment (i.e. braces and/or clear aligners). This technique maybe performed manually using a thin, flexible hand-strip or with a specially-designed rotary handpiece that has a thin/flexible disc attached to it, to gently smooth/polish and re-contour the outer enamel layer between adjacent teeth. IPR is performed in small increments, removing only approximately 0.2 mm (as thin as a sheet of paper) of outer enamel between the teeth. Because there are no nerve endings in enamel, the procedure is painless and does not require any anesthetic. Numerous clinical studies among patients that have had IPR have demonstrated that the procedure does not make teeth more susceptible to cavities nor does it predispose gums to developing gum disease. 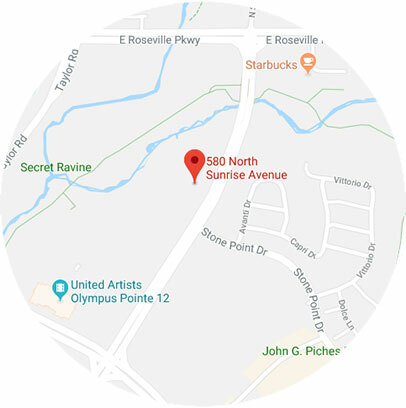 IPR has been employed safely for over thirty years with great long term successes. You can download our IPR patient handout attached at the bottom of this page.